Call us at 203-842-8388 to bring your ticket and claim your prize! 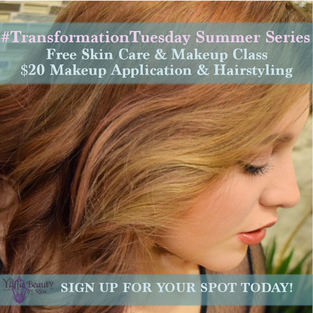 Our #TransformationTuesday Summer Series continues! Register for the event today - spots are limited! We will be holding a skin care & makeup application class, and, for $20, you can get your hair styled or your makeup done by me after the class! Haircuts, conditioning and color are essential! Learn how to get your hair prepped before Memorial Day! Since opening, Yaffa Beauty by Rica has been getting more and more attention, which means more and more reservations. Be sure to book your appointment now so you don't have to wait! ​With over 15 years of combined business and beauty experience, Rica brings a sense of style, sensitivity and skills to Yaffa Beauty. Having a background in theatrical hairdressing and makeup, as an Independent Beauty Consultant with Mary Kay Cosmetics and a Paul Mitchell the School graduate, Rica has a unique skill set to work with clients on achieving their image goals, as well as a greater sense of self-confidence.